The GDP provides the underlying economic support basis for the valuation of the stock market. As GDP grew in the 1980's increases in wealth supported a conservative 50% to 60% market capitalization. The stock market, with its cyclical risks, would be always worth less than the nominal worth of the GDP. That has now changed. Increased shift of capital from making investments in GDP growth to profiting from oscillations of the stock market resulted in a wide range of stock prices while GDP declined. 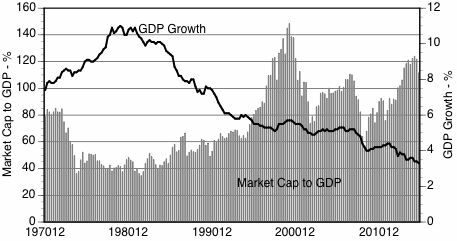 The ratio of the the stock market capitalization to GDP ratio increased to over 100% while the GDP growth declined from over 10% to about 3% at preset.